Whether you are trying to train a child or you are an adult who wants to get started in competitive swimming, the training is the same. Learning the proper swimming methods in the water, as well as practicing certain drills on dry land, will provide you with the best competitive swimming experience. Your body needs endurance and strength to succeed, which can be reached in a variety of ways. The proper swim gear can help swimmers build endurance and strength. While it is important to perfect the four major strokes, you will need to be able to build your endurance and strength to be competitive. Before perfecting any stroke, you should focus on endurance. Kickboards are a great way to build endurance because it allows swimmers to focus solely on their legs and not on the movement of their arms or head. Keeping their head above water, swimmers can perfect their kick, slowly increasing the number of laps they can do comfortably. Once the endurance is built up, swimmers can learn to perfect their strokes. The four major strokes are freestyle, backstroke, breaststroke and butterfly. Focusing on one stroke at a time will help swimmers perfect each one before moving on to another. Once the strokes are perfected, swimmers can then learn to vary them within each swimming session; this will allow them to participate in medley races that incorporate two or more strokes in the same race. Strength is an important component of competitive swimming. Once swimmers have mastered the endurance, you can begin adding training tools, such as pull buoys and swim paddles, to give swimmers the additional resistance required to build up their strength. A pull buoy allows swimmers to keep their legs stable, while their arms get the intense workout, pulling the body through the water. 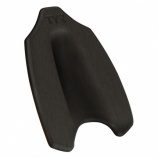 Swim paddles give swimmers extra resistance as their arms skim the water, allowing the body to build more strength. Swimmers can also practice weight training outside the water to further their strength in the water. Training beginning swimmers to be able to participate in competitive swimming is a process that can easily be done if it is taken slowly. Children and adults can learn to swim competitively by working on improving endurance, perfecting their strokes and building up their strength. Swimming is a sport that can be enjoyed by people of all ages; it is never too late to begin perfecting your swimming to participate in competitive races.